It is our goal to provide lasting, loving, and knowledgeable homes to each of the reptiles sold here at Mynewturtle; be they captive bred babies or rescues brought in. HOME OF THE IVORY BOX TURTLE! Another Ivory box turtle has been born! 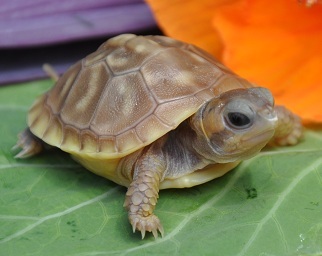 See the Ivory Box Turtles page for pictures. Crickets are NOT the staple diet for baby box turtles! But it does show how fast these little guys can run!